"This is a yellow cake. 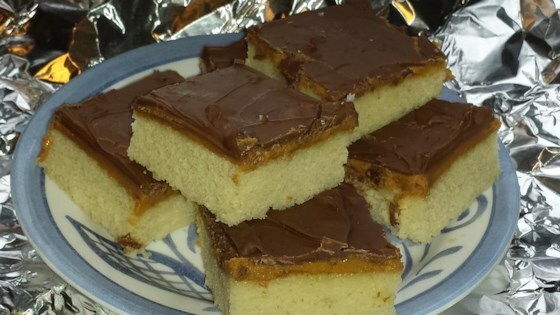 Peanut butter and milk chocolate are spread over the cake, making it a peanut butter candy cake." Preheat oven to 350 degrees F (175 degrees C). Grease and flour a 10x15 inch jelly roll pan. In a large bowl, mix together eggs, vanilla, salt, sugar, flour, and baking powder. Blend in melted butter or margarine and milk. Bake for 15 to 20 minutes. Spread with peanut butter while still hot. Refrigerate until cool. Melt chocolate bars, and spread on cooled cake. This recipe not only is very easy to prepare, it makes a moist, delicious cake that chocolate/peanutbutter lovers are sure to enjoy. I have made this at least a dozen times. It is delicious. Very easy to make. Every one will love it. Good flavor, but didn't care for the texture of the cake...a little on the tough side.